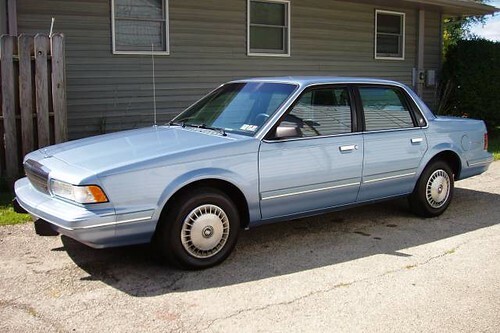 On Friday I said goodbye to a good friend: my 1993 Buick Century. I bought this car right after graduating from college. It had about 60,000 miles on it and not a spot of rust. For about 6 years she did almost everything I asked of her. As far as I can remember, she never abandoned me. The muffler was a constant problem though. 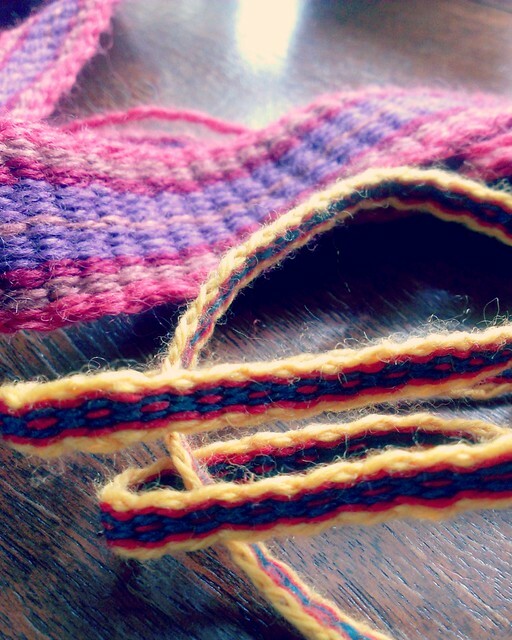 In fact, I remember sitting in the muffler repair shop knitting the garter for my wedding in 2009. She got me to my first job after college and every one since. When I started traveling to shows, I crammed as much fiber in there as possible. It was hard to believe how much stuff I could get in there, but those old cars had BIG trunks! In the end I knew time was running short. Things were going wrong, leaks were appearing, the transmission lines were rotting… but the car was still running, so it was hard to say goodbye. I’ll always think on you fondly, Gladys! Of course I’d been pondering her replacement for some time. I knew it needed to have more storage, or at least be easier to load. Plus I wanted something that could tow. 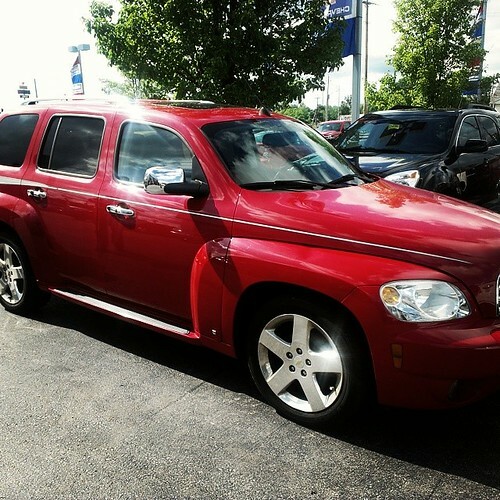 I had been looking at various SUVs, though in the end I found a Victory Red 2008 Chevy HHR. It was a lot newer and fancier than I had hoped to find, so I am pleased. 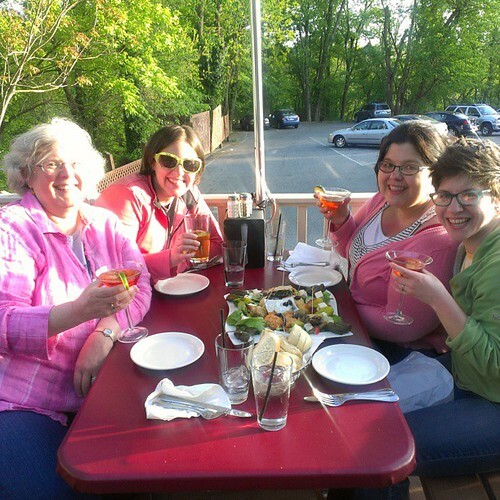 Now it is time to make new memories with Ruth! We made it home from the Maryland Sheep & Wool Festival in one piece. It was an interesting weekend followed by wisdom teeth extraction on Monday morning from which I am still recovering. It is going to be difficult getting back into the groove. At four hours, the drive was quite pleasant and the weather couldn’t have been better. We stayed at a fancy golf resort complete with schmaltzy piano music blaring in the lobby. Saturday morning we headed out to the fairgrounds early to get a close spot and even though the event officially opened at 9 am, no one was stopped from milling around before that. 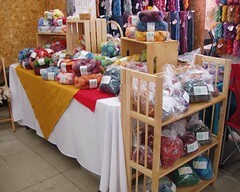 My first stop was Zeilinger’s tent to drop off fleeces and the fleece sale to find a few more. Ana took the photo below while standing in line. They let in 25 people at a time so we wouldn’t be crushed or elbowed, but it was still close quarters. I had to crawl under a table at one point just to get to the other side. With 800 fleeces to look at, it was basically impossible to see everything and incredibly hard to decide what to buy. After searching, I found two that I was ready to take home. One a Bluefaced Leicester/Shetland cross and the other a Border Leicester cross. However, after waiting in line to pay, I was told I couldn’t take the BL because it was supposed to be in the silent auction. That left me with one fleece and a very bad mood. By that point I had no interest in going back into the chaos and just left. I moped around most of the morning, feeling overwhelmed by the crowds and disappointed by the fleece debacle. Eventually I came out of in the afternoon, but I didn’t really buy much all day. 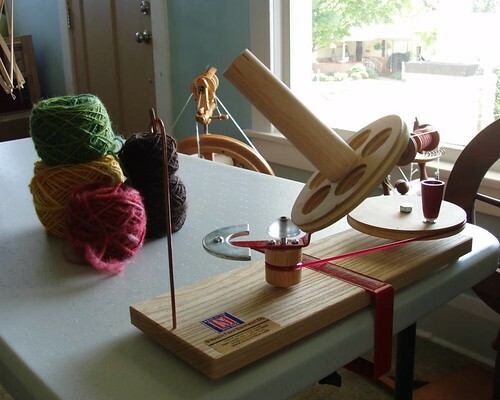 One jumbo bobbin, one gallon of Kookaburra wool scour, a pound of random fiber, and soap. In the evening we met up with some friends and had a great dinner. I have to admit that was my favorite part of the weekend. Cosmos! Hummus! Sunshine! Laughter! It was a good end to a somewhat rumpled day. The next morning I was ready to start over again. Corespinning started at 9:15, so I was there at 8:30. Things went well enough that I didn’t feel utterly crushed or hopeless. Not to say I am an expert, but I am excited to keep trying. 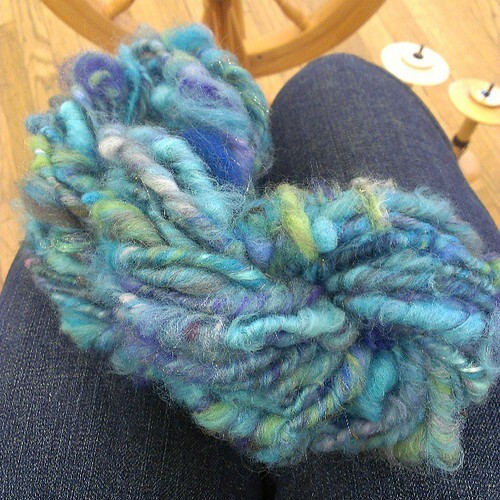 My yarn was incredibly lumpy, while all the other ladies made theirs so even and relatively thin. I don’t quite know how they achieved that. Also, I thought this was sort of an “art yarn” technique and the point was for it to be funky. Whatever. If they are happy with the results and so am I, it doesn’t matter. Over all it was a good weekend. I just can’t see myself making this event a regular stop on my schedule. Honestly, I don’t need that much selection, especially when you can’t get in the booths to look at anything! It did successfully keep me from thinking about my impending oral surgery the following Monday morning. 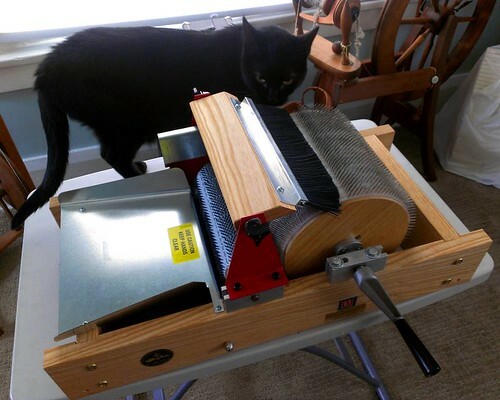 Now that is over too and soon I will get to experiment with corespinning! I am going full blast on ordering things! 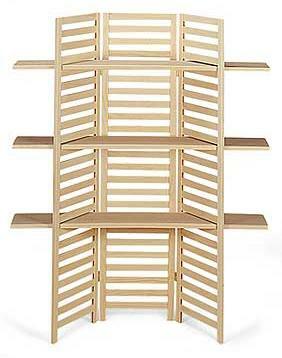 Last week I decided to buy a set of wood folding shelves. They are a style I’ve seen around at shows for a long time, even in SCA merchant booths, but I could never find them. Every time I typed “folding wood shelf” into Google I’d get something that was more of a bookshelf than anything else and only about 3 feet high. About a year ago I bought two of those type and one immediately became integrated into the house (now full of CDs and videos). The other has been used as an endcap and filled with bags of locks. I don’t dislike it, but I wanted something that was tall enough to stand on its own and didn’t require squatting to reach the bottom. I ended up finding the long sought after shelves at Woodland Marketing. It was recommended by someone on Ravelry (same place I heard about Got Print!). I browsed through the different heights and widths, and decided to go with the 5′ x 4′. I thought it would be a manageable size for me, and I can use the 4 foot shelves I already have to add more space. I think these will go well with my crates in color and style. Can’t wait to fill them up! Did I mention they were marked 40% off? Yep, the boxes just keep coming. And this time it was an impulse buy. 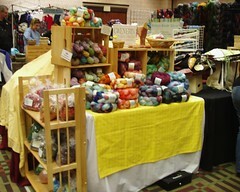 I recently joined a group on Ravelry called Fleece Market. It’s a place where farmers can sell their fleeces and people like me, who just loiter around the farms but don’t actually do anything with sheep, can buy fleeces. Even though I prefer to see, smell, squeeze, and ponder my fiber before purchasing, I thought this might a good way to get ahold of some breeds I haven’t been able to find around here. And without a whole lot of thought, I “popped” on a 5 lb white BFL cross from Iowa. The fleece belongs to Sophie, who has a rather complex lineage it seems. Her mom is 1/2 Romney, 1/2 Corridale and her dad is 3/4 BFL, 1/4 Merino. Phew! Pretty exciting, eh? I was planning on dyeing this weekend, so I’ll wash some up to see how it looks clean. From what I have already seen, I think it’s going to be a good one.